Royal Elite Small White Goose Feather Bed with 100% down-proof cotton shell. Available in 4 sizes. Sizes and weight: Twin - 40 x 76" + 2" - 7 lbs., Double - 55 x 76" + 2" - 10 lbs., Queen - 61 x 81" + 2" - 12 lbs., King - 79 x 81" + 2" - 15 lbs. 233 thread count, 100% down-proof cotton shell. Ambassador Waterproof Mattress Pad Cover offers luxurious protection for the ultimate nights sleep. Featuring plush fibres which provide comfort and absorbency for maximum comfort from the moment you enter your bed. 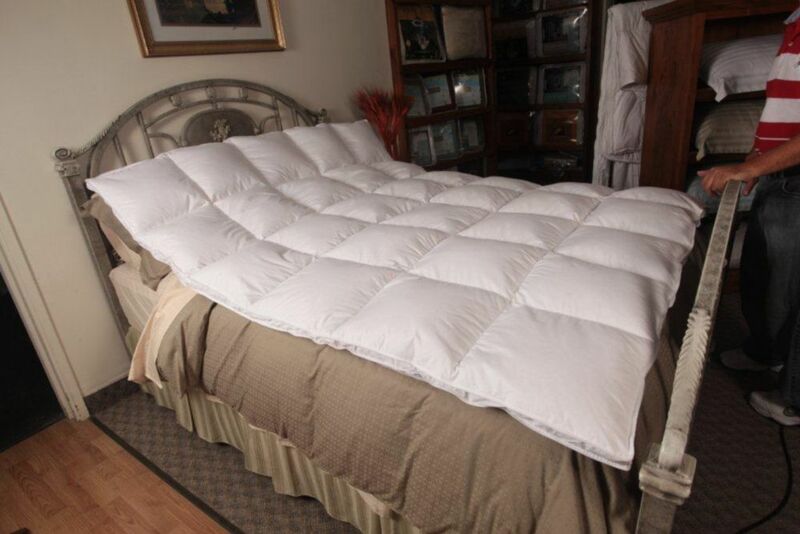 This soft, quilted sheet, mattress and furniture protector under pad helps protect bedding, furniture and wheelchairs from moisture. It's great to use to protect children's beds while potty training or to protect furniture from pet accidents. It's also ideal for protecting the beds of incontinent patients. The fabric side is extra absorbent and keeps moisture away from the skin while the waterproof bottom layer helps prevent leakage. You will feel like you are sleeping on a cloud after you lie down on this natural sheepskin bed pad. Its effective design helps prevent pressure sores and ulcers while also providing enhanced airflow to maximize your comfort level as you sleep. The natural sheepskin material is pleasantly soft and comfortably cushions your body in all of the right areas. Ideal for the home, hospitals and nursing homes. No matter where you sleep you will feel refreshed when you wake up in the morning. The sheepskin is recommended by healthcare professionals as the preferred surface for pressure ulcer prevention. When you want to protect a piece of furniture from moisture, this pretty floral pattern seat pad is the answer. It's ideal for protecting wheelchairs, regular chairs, beds and even pet beds from small amounts of moisture. The top surface is made of brushed polyester and feels soft like flannel against the skin. The bottom layer is highly absorbent and water resistant. It's reusable and machine washable. White Goose Featherbed, Double Royal Elite Small White Goose Feather Bed with 100% down-proof cotton shell. Available in 4 sizes. Sizes and weight: Twin - 40 x 76" + 2" - 7 lbs., Double - 55 x 76" + 2" - 10 lbs., Queen - 61 x 81" + 2" - 12 lbs., King - 79 x 81" + 2" - 15 lbs.